A car covered by debris is seen near a collapsed wall following an earthquake in Quetzaltenango, Guatemala, June 14, 2017. Five people were killed and seven injured by a magnitude 6.9 earthquake that struck Wednesday in western Guatemala near the border with Mexico, Guatemala's national emergency coordination agency reported. The fatalities included a woman in the city of San Marcos who was killed by a falling wall and a homeless man in the town of San Sebastian Retalhueleu who was struck by the collapse of part of a church. Both locales were close to the epicenter. Three women in different departments, or states, died from heart attacks attributed to fright caused by the pre-dawn quake. Authorities reported moderate damage to homes, some landslides that blocked highways and at least seven people hurt. "We greatly mourn the loss of lives,'' President Jimmy Morales said. 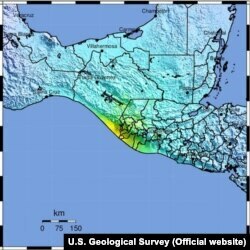 The U.S. Geological Survey reported the earthquake was centered 8 kilometers (5 miles) southwest of Tajumulco, Guatemala, at a depth of about 111 kilometers (69 miles). The emergency coordination agency said the quake struck at 1:29 a.m. local time (3:29 EDT) and was felt throughout the country. Authorities reported power was knocked out in several departments. San Marcos, which is home to about 25,000 people, lies 20 kilometers (13 miles) from the epicenter. The mountainous region is sparsely populated with communities scattered around the base of the dormant Tajumulco volcano. Most residents are small-scale farmers or run small businesses. Officials said classes in the area would be canceled Wednesday to allow school buildings to be inspected. The earthquake also rattled the Guatemalan capital, waking residents but without causing damage there. Across the border in Mexico, Gov. Manuel Velasco of the southern state of Chiapas said via Twitter that there were reports of cracked walls and shattered windows in Huixtla, but so far no injuries. Local Civil Protection authorities said the quake was felt throughout the state. There was no tsunami warning.